In his Inaugural Address President Gerald Ford's statement "Our long national nightmare is over ..." referred to the impeachment and resignation proceedings of President Richard Nixon after the Watergate scandal. Many of us in the site selection community no doubt expressed similar sentiments when the long, winding and at times unseemly 14-month Amazon HQ2 search concluded on November 13, 2018 — one week after the mid-term elections, a date our firm had gone on the record to predict. While over-the-top and in-your-face as only an Amazon could pull off, HQ2 is very much in sync with the heightened trend of corporate headquarters mobility. Today, corporations are no longer keeping the headquarters location off the table when it comes to restructuring, cost-cutting and re-branding their companies. Head offices are now just as footloose as any office, plant or warehouse of the modern corporation. John Boyd is principal and founder of The Boyd Co., Inc., a location consulting firm based in Princeton, New Jersey. I have witnessed a number of high profile, trend-setting corporate headquarters relocations over the years, including those of longtime Boyd clients such as Sun Life Financial, which was the face of corporate head office migration from Montreal to Toronto during the separatist movement in Quebec in the late '70s; UPS, whose move from Greenwich, Connecticut, to Atlanta in 1991 brought into the modern era Atlanta's reputation as a major international center for transportation and logistics; and our Boeing client, whose move from Seattle to Chicago in 2001 ushered in the current era of accelerated head office mobility and the crafting of headquarters-specific state incentive programs. But for all of the fanfare and trend-setting significance of those three high-profile moves, they all pale in comparison to the epic, transformative HQ2 search, clearly one for the ages. Due to the magnitude of the project and duration of the search, HQ2 brought our cottage industry of corporate site selection out of the shadows of confidentiality and shroud of client anonymity and into the sunlight. The media's fascination with the e-commerce giant Amazon and its founder, Jeff Bezos, along with the 24-hour news cycle, propelled this epic search from the back pages of the business section to front-page news. I have even been approached to write a book on the search with an eye toward a movie script. I am sure the legendary late McKinley "Mac" Conway, founder of Site Selection 65 years ago, would not believe it, seeing the industry he created "going Hollywood." When it comes to the controversial topic of incentives, Amazon, for years, has been a master of securing hefty financial incentives from local and state governments for its North American network of warehouses and fulfillment centers. Not surprisingly, Amazon brought its "A" game to the negotiating tables for HQ2. New Jersey pledged $7 billion in incentives, Pennsylvania offered $4.5 billion, New York offered $2.8 billion, Virginia offered $750 million, North Carolina offered over $1 billion, although the exact number has not been released. The notion of giving the richest man in the world millions of dollars in incentives was low-hanging fruit for the anti-incentive movement led by people like progressive Senator Bernie Sanders, futurist Richard Florida and free market libertarian groups like the Cato Institute and the anti-incentive think tank, the John Locke Foundation. There was a bit of irony here too, as Amazon placed its New York HQ2 smack in the middle of the district of newly elected Alexandria Ocasio-Cortez, the ultra-progressive firebrand who has already come out strongly against Amazon's incentive windfall. Expect to hear more from her in the days ahead. 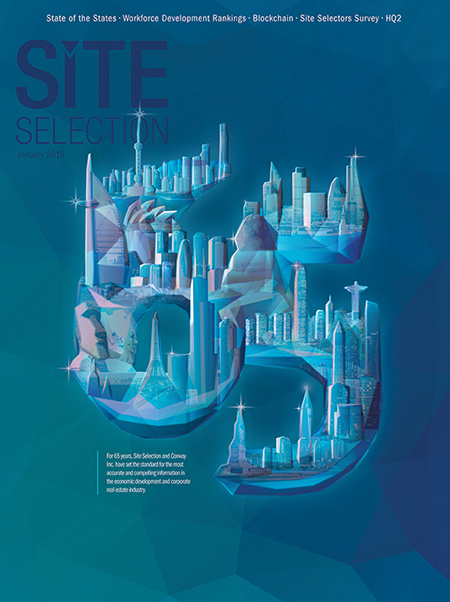 Agree with them or not, incentives are now ingrained into the corporate site selection process. Today, our clients want it all. They want us to recommend the optimum location for their plant or office and then have government step up to help write down the cost of the move. The harsh reality is that incentives are a necessary evil when it comes to a city's being in the game, especially for trophy projects like HQ2 and for states with comparatively high taxes and high costs of doing business. To those who oppose incentives, I would have them challenge the politicians to first do the heavy lifting of pension reform, lowering taxes, easing onerous regulations and generally making business climates more friendly. Another point here is that most incentive packages go beyond tax credits and abatements and often include things like infrastructure investments and workforce training grants that serve a greater public good and enhance the overall operating environment for small business and entrepreneurs. Of all the drivers in the HQ2 site search, it was available talent that ruled the process from day one. The decision to split HQ2 into two cities was not at all surprising given record low unemployment rates coast to coast and the robust national tech economy. What was surprising is how late in the curve Amazon indicated they were moving in that direction. At the outset of the search, it should have seemed a bridge too far that any market, regardless of how large it is, could provide and sustain a 50,000-strong high-tech workforce. That said, recruiting 25,000 workers in each of the two winning cities will be no walk in the park for Amazon's HR team. I would not be surprised to see additional satellite offices in proximate locales having quick access to Crystal City and Long Island City getting a sliver or spillover of HQ2 jobs. A Newark satellite office of Long Island City or Baltimore satellite office of Crystal City would fit this bill nicely. The New York media is now giving a loud voice to the backlash against Amazon's Long Island City decision. Many New Yorkers feel the area is already too congested and are concerned about the negative impact the project will have on the poor in this rapidly gentrifying community. Critics point to Amazon's record in Seattle where its highly paid workforce led to unsustainable gentrification, along with skyrocketing home prices and rental rates, congestion and a sharp rise in homelessness. Crystal City puts Amazon close to tech talent, but also closer to government leaders, cloud customers and the U.S. Department of Defense. Make no mistake about it, Amazon's 25,000 workers in Crystal City will present recruiting challenges for both Amazon and the Feds. For Amazon, the challenge will be hiring government workers that can adapt to a more competitive, fast-paced and less secure environment. For Uncle Sam, the challenge will be competing for upwardly mobile talent with goliath Amazon's higher pay, bonuses and superior career potential. Another takeaway of the Crystal City decision is a new talking point for relocating government agencies out of Washington to other cities around the country. This is a concept which pre-dates HQ2 but is now gaining momentum and rare bipartisan support post-HQ2. President Trump has long indicated support for moving government agencies out of Washington as a way to "drain the swamp," and Democrats view this as a huge economic development opportunity for their home districts. Think about a move of the U.S. Weather Service to Miami or New Orleans, a move of the Food & Drug Administration to Chicago or Minneapolis, a move of the Department of Transportation to Atlanta or Memphis, a move of the Department of the Interior to Denver or Phoenix or a move of the Department of Agriculture to Kansas City or Omaha. Let's face it, government administrators can interface with elected officials and participate in hearings from anywhere in the country — all they need is WiFi. A migration of federal agencies from the nation's capital to the hinterlands would also free up millions of sq. ft. of valuable, tax-paying real estate in the very hot Washington market. Along with winners Long Island City and Crystal City, Nashville was named as the site for Amazon's new Center of Excellence for Operations, its unit that is responsible for the company's transportation and supply chain operations. Nashville will receive 5,000 jobs. This was not a big surprise to me. Nashville and Middle Tennessee house a universe of supply chain professionals from the auto industry, which has major facilities in the region. Our logistics-savvy client, Dell, maintained a major global supply chain unit in Nashville. What also helped Nashville win the Amazon supply chain unit is the Music City's recent attraction of the old-line Wall Street financial services company AllianceBernstein. This huge head office relocation from New York City went a long way towards elevating the stature of Nashville from an executive relocation standpoint. The Wall Street firm is bringing over 1,000 investment professionals from Manhattan to downtown Nashville, now in the big leagues of head office attraction with the likes of Atlanta, Dallas, Denver and Houston. The cities that fell short — those 18 bridesmaids — won by losing. They got all of the public relations benefits of being in the mix for the largest and highest-profile corporate headquarters move in the history of economic development, while sidestepping all the burdens Amazon would place on infrastructure, housing and recruiting. The HQ2 process allowed Pittsburgh to talk about its Robotics Row and Carnegie Mellon's leading AI program to a global corporate audience. It allowed Miami, the gateway to Latin America, to talk about South Florida's new Bright Line transit system, its multilingual skill sets and absence of a personal income tax. It allowed Raleigh to promote the world-renowned analytics program at North Carolina State University and the Tar Heel State's restructured tax incentive program. It allowed Toronto to talk about Canada's low corporate taxes, its liberal immigration and new free trade pacts with Europe and Asia. It allowed Newark to promote its premier fiber-optic infrastructure and transportation assets. HQ2 also helped to form new coalitions among economic development operatives and local community leaders from the academic, political and business communities. The process also allowed losing cities to forge relationships with Amazon executives that could lead to new Amazon or Amazon subsidiary expansions in the months and years ahead. Post-HQ2, these new coalitions will live to see another day and end up being another arrow in the quiver of these industry-hunting cities. If I had to name two cities that were surprise no-shows to the list of 20 HQ2 finalists, I would name Charlotte and Minneapolis. Charlotte, still reeling from this, has fired its longtime economic development director and restructured its promotion agency. Minneapolis — the 14th largest metro in America — not making the top 20 was also surprising given Amazon's aggressive entry into the healthcare space. Minnesota governor Mark Dayton was almost too eager to describe his state's incentive package as "restrained," a word heard by many as code for not really wanting HQ2 there. Other states offered modest packages but did not broadcast it. Contrast this with New York governor Mario Cuomo, who joked about changing his name to "Amazon Cuomo" in order to snag HQ2. Amazon's HQ2 site search has given birth to a new head office site selection driver that we are terming "social impact." Politicians and the public are growing weary of large incentive packages awarded to deep-pocketed companies — especially when many of these same companies are facing potential anti-trust, data security and privacy challenges by government regulators. That said, one way these companies can mitigate backlash about incentives and curry the favor of the public and lawmakers is to promote their just business practices, i.e., those activities fostering equitable growth and social equality. We expect this to be a site selection rationale that poorer cities with first-rate head office markets — such as Detroit, Newark, Chicago and Miami — will be incorporating into their sales narratives to post-HQ2 prospects. Some of the nation's most prized commercial real estate assets have been in suspended animation during the long 14-month HQ2 search. These include prime real estate sites like: the Philadelphia Naval Yard, Suffolk Downs in Boston, Miami's Innovation District, the Gulch in Atlanta, Lincoln Yards in Chicago, Pittsburgh's Hazelwood Green, the Exposition Park site in Dallas, Denver's Lone Tree site and others. Now that the shackles are off, we are hearing from local developers that these sites are open and very much back in business. In the days immediately after Amazon's announcement, we have seen a flurry of previously stalled projects like San Francisco–based alternative lender Affirm announcing a 500-worker center in Pittsburgh, online retailer GoPuff.com expanding in Philadelphia and Advance Auto Parts and Honeywell relocating their headquarters to Raleigh. Norfolk Southern's head office move to Atlanta, announced in December, was predicated on securing a deal with the city to purchase acreage in the Gulch District that was scouted by Amazon as a candidate site for HQ2.